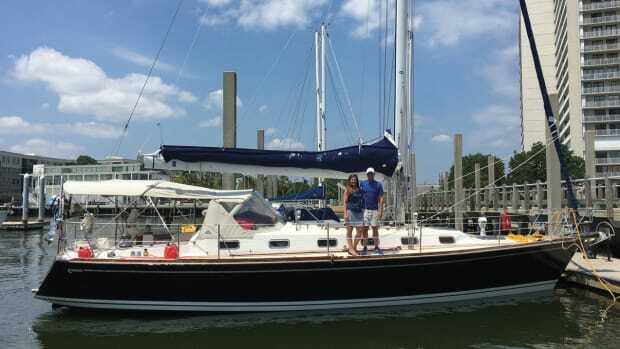 The Catalina 385 is third in a series of new boats that began in 2009 with the award-winning 445 model.  The concept behind this “5” series of boats is fairly simple: marry the best aspects of modern mass-production cruising boat design and construction with a healthy streak of common sense and practicality. In bringing this concept to fruition, Catalina’s design and engineering maven, Gerry Douglas, has done an excellent job of separating the wheat from the chaff. 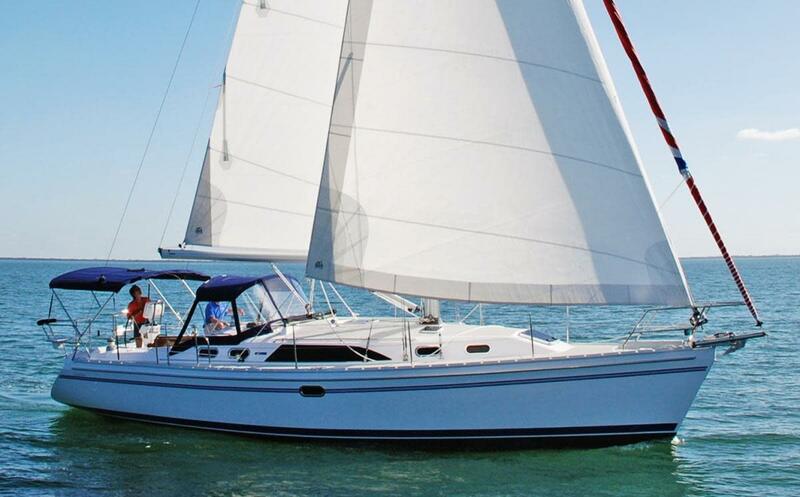 This latest offering, falling as it does between the 445 and the smaller 355, should be very attractive to both experienced and novice cruisers looking at contemporary boats under 40 feet in length. Construction Construction of the 385 is very similar to its predecessors. The hull is solid hand-laid fiberglass, with knitted and unidirectional fabrics set in polyester resin, except in the laminate’s exterior layers, where vinylester resin is used to resist osmotic blistering. A dedicated structural grid designed to carry all rig loads is bonded and tabbed to the hull, and there is a collision bulkhead forward, just abaft the anchor locker. The deck is balsa-cored with a joint set on an internal flange, bonded and bolted on 4 inch centers. The ballast is lead. The rudder stock and the rudder’s internal framing are stainless steel. Systems aboard are thoughtfully laid out, with an emphasis on maintenance and ease of access. 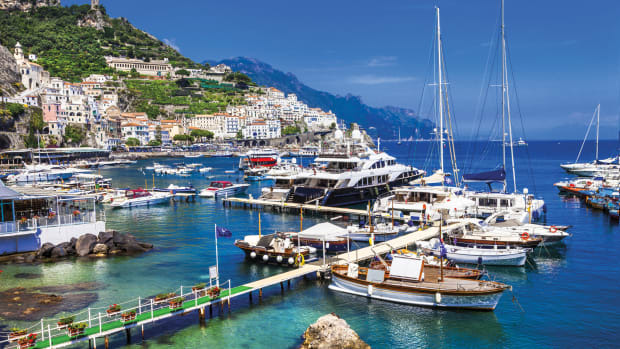 Systems installations and construction and finish quality, on the whole, are well above average for a mass-produced boat. On Deck One critical feature of all the “5” series boats is that, by modern standards, they are not overly beamy. The cockpit on the 385 is thus not quite as capacious as those found on some competitors’ boats, although it is far from cramped. It has a fixed table with fold-down leaves and is large enough for entertaining at anchor. Though you cannot walk straight through to the swim transom, the single centerline wheel on our test boat folded in on itself to make this transition as smooth as possible. One particularly nice feature is the pair of stern seats incorporated into the aft pulpit. As a working space, the cockpit is very functional and ergonomic. The high coamings provide excellent back support when seated, sightlines from the helm are superb, and workstations around the primary winches and coachroof winches are easy to access and use. The traditional teak grate on the sole, besides being attractive, provides great footing, particularly when things get wet. Moving forward from the cockpit you’ll find nice high lifelines (27in), plus well-placed handholds and aggressive antiskid to help keep you from slipping off the deck. Accommodations Having avoided the trap of pushing the boat’s beam out to ridiculous proportions to increase interior space, Douglas nevertheless has succeeded in crafting an efficient, yet comfortable accommodations plan. 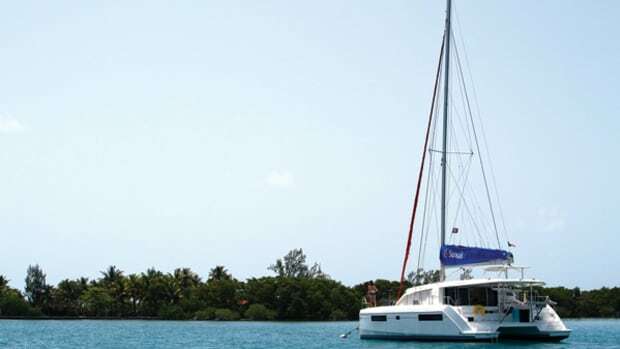 The owner’s stateroom forward is generously sized, with lots of storage and an island double berth that boasts both an inner-spring mattress and an articulated tilting mechanism at the head for sitting up and reading. The single head on the boat is forward to port. 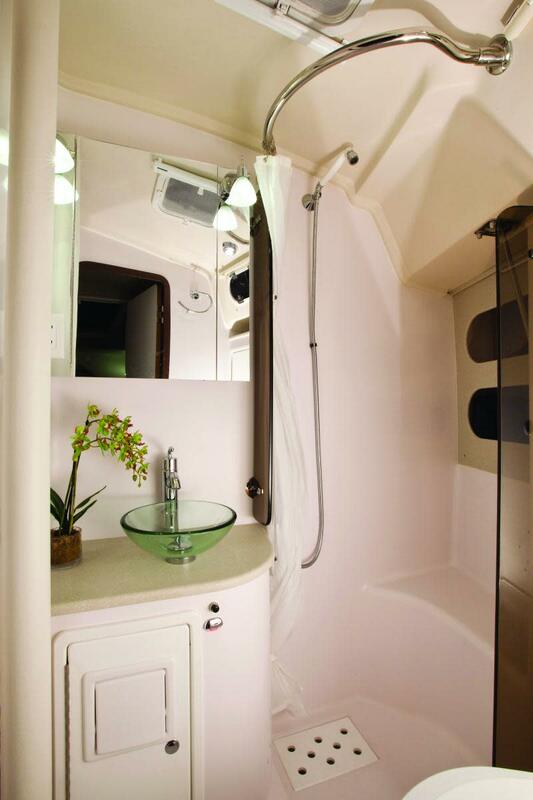 Though compact, it is well laid out, with a dedicated stall for showering. 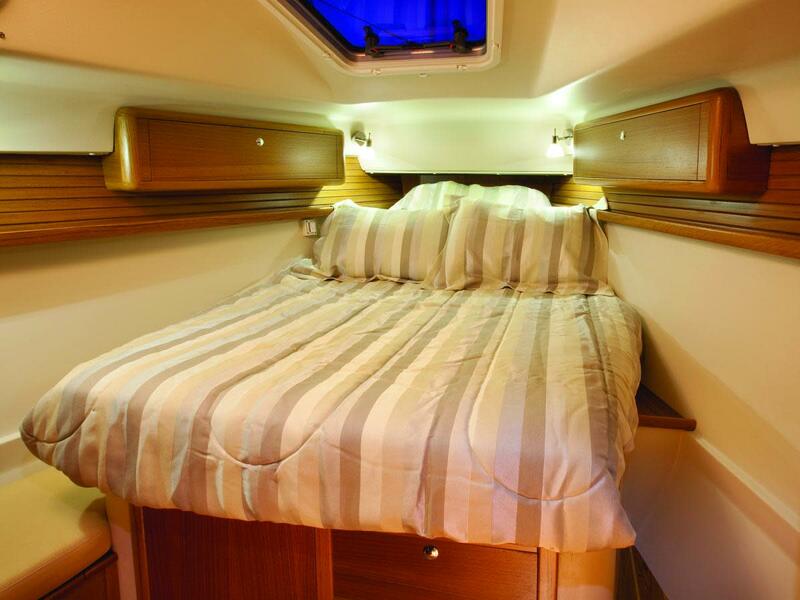 The saloon is straightforward, with the galley and twin captain chairs (which can convert to a single full-length settee) to starboard and a dinette to port. The quad-leaf saloon table takes up little space when folded away, and the nav station at the aft end of the settee is unobtrusive yet functional, with a cleverly designed laptop computer bin in the desk. If desired the boat can also be ordered with a table that folds down from the forward bulkhead. 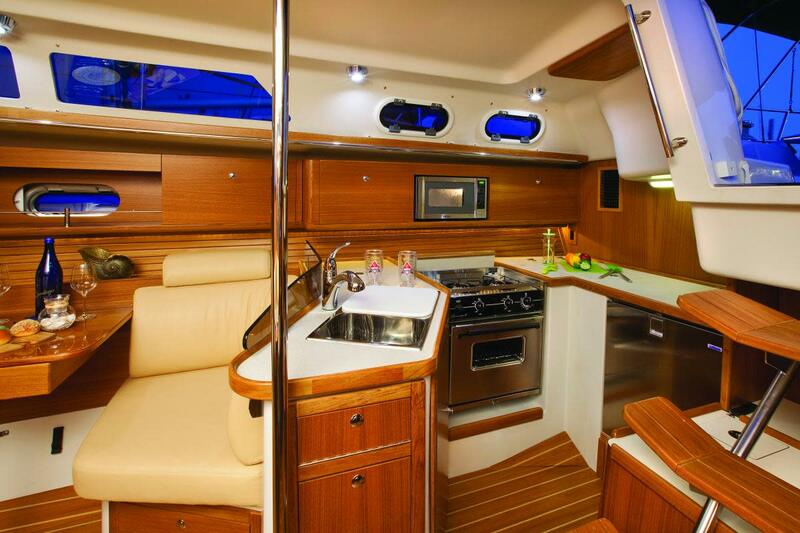 The galley is particularly impressive and should work well in a seaway. The work area features plenty of usable counter space and is enclosed, so a cook can easily brace in place. Particular attention has been paid to storage here, with spaces carefully crafted to receive commonly used items. Our test boat boasted a front-loading refrigerator, a top-loading fridge/freezer, plus a microwave oven. All the way aft you’ll find another stateroom for guests. This has an athwartship double berth and is reasonably well lit and ventilated. Finish quality throughout the interior is good. The teak furniture is all assembled by hand, with solid wood used in the corner posts and doors. Storage is superb, with no fewer than 11 drawers installed, including under the settees. Under Sail Gerry Douglas’s ability to blend the best of traditional and contemporary design elements is perhaps best illustrated in the rig of the 385. 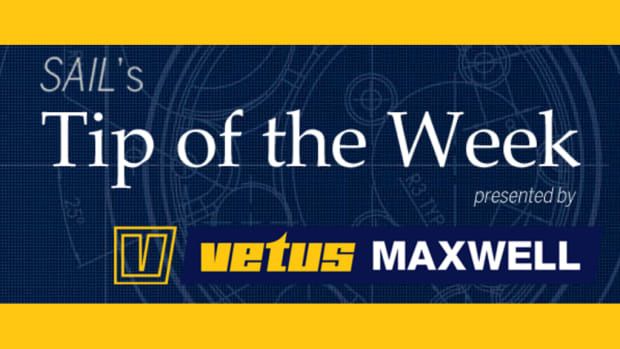 Here you’ll find such seemingly forgotten, but useful features as a long mainsheet traveler, an overlapping genoa sheeted to a long genoa track, and a mast with in-line spreaders that let you ease the main boom out perpendicular to the boat’s centerline. 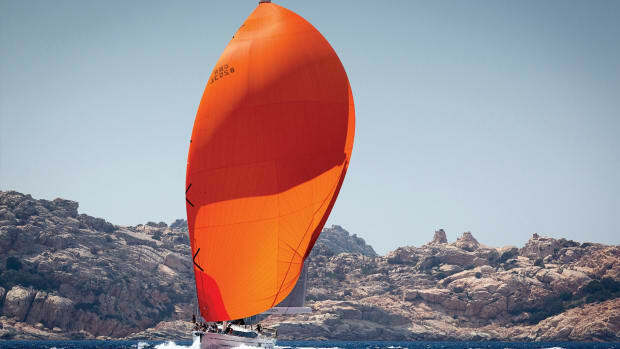 More modern elements include an in-mast furling mainsail with vertical battens to maintain sail shape, and a removable bowsprit for flying modern gennakers and asymmetric spinnakers. Unfortunately, during our test sail on Chesapeake Bay we had very little wind to work with. Sailing in just 5 knots true wind, we did manage to keep our boatspeed well over 3 knots flying a big nylon gennaker at apparent wind angles of 60 degrees and lower, switching to a 150 percent genoa for close-hauled angles up to 40 degrees. 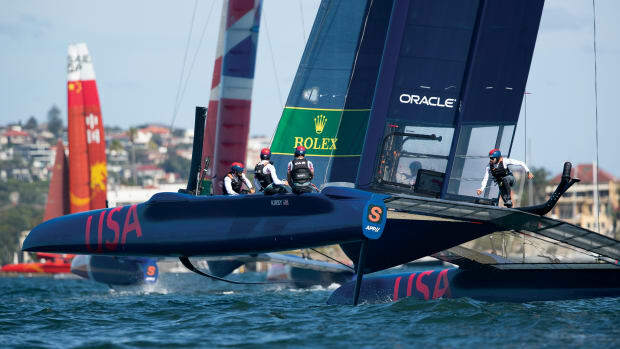 Though we were sailing the shoal-draft version of the boat, I felt little leeway slippage. The helm was positive, with good feedback and no tendencies toward a lee helm. Given the boat’s moderate beam, I would expect she’d also sail well to windward in heavier air. Under Power I was surprised to find that the 385 did not motor quite as well as I expected. Though the 40hp engine seems appropriately sized, we made just 5.6 knots motoring in flat water at cruising revs of 2,200 and 6.4 knots at 3,000 maximum revs. Other writers, however, have reported better results, so this bears checking if you are test-sailing the boat yourself. Control under power was excellent. The boat stopped within two boatlengths when backed down hard from cruising speed and turned in about one and a quarter lengths. Steering control while backing down was very good. Access to the engine itself is good. 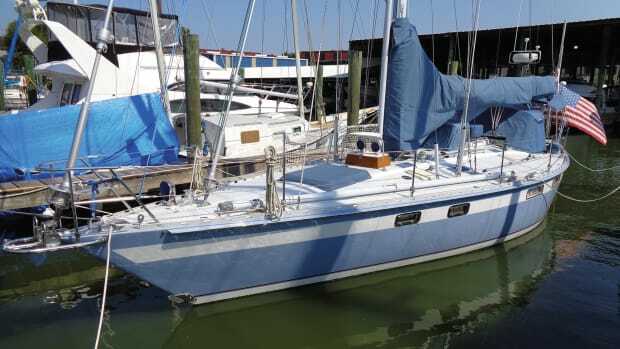 There are hatches and doors in the engine box for routine checks, and though these may seem a bit undersized, the entire box (and the companionway steps in front of it) can be easily removed. Conclusion The Catalina 385 is a worthy stablemate to its larger and smaller sisters. If you’re looking for a new boat in this size range that embraces the best in modern design without sacrificing practicality and sailing ability, you can’t do much better than this. She’ll serve well as a family coastal cruiser and with appropriate modifications could also go offshore.